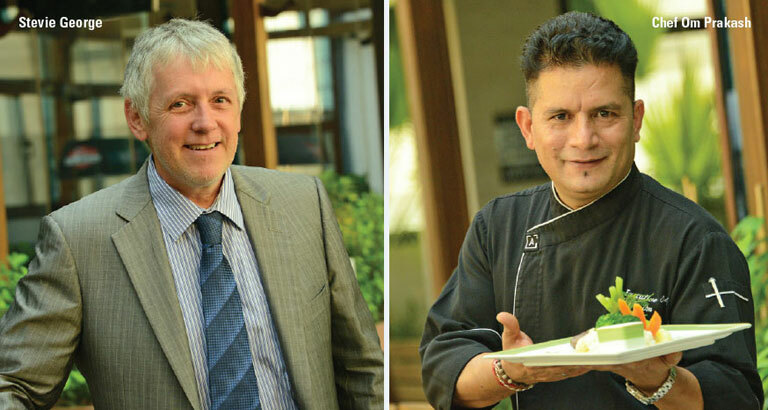 Managing the diverse kitchens of Atiram Premier’s eateries is executive chef Om Prakash. He is in charge of costing, sourcing the ingredients and planning the menus of Wembley, Coda Jazz Lounge and Cavallo, as well as the cuisine selection for banquet hall events. Om considers maintaining the quality of food to be his biggest challenge. Om started his career in Novotel, Oman, after completing a year-long diploma in Delhi, India. “I’ve been with Atiram for the past two years and consider it as my greatest career move yet,” he adds. A nutritious menu has been introduced at Wembley to cater to the health-conscious. Wembley manager, Stevie George, works tirelessly to keep up the reputation of the upmarket sports bar. “I put a lot of effort into greeting as many customers as possible, to see that Wembley is providing the services to the level they are expecting,” he explains. Being a renowned disc jockey for 26 years, he has an immense knowledge of the entertainment sector. “Having worked with many different bar and club managers over the years, I’ve developed the necessary know-how to be of benefit to the industry,” he adds.